Drummer Cindy Blackman's solo output has been sporadic since touring and recording with retro-rocker Lenny Kravitz for the past fifteen years. Recorded in 2005 with her regular working quartet, Music For The New Millennium is a double disc collection of inspired post-bop that heralds her return as a session leader. A persuasive reminder of her technical prowess, it reveals a stylistic allegiance to past masters while keeping an eye to the future. Blackman is heavily influenced by the enigmatic writing of saxophonist Wayne Shorter, which fueled Miles Davis' classic second quintet. Like Davis, she shares an affinity for Shorter's dark, impressionistic streak. Embodying the key instrumental elements of Davis' classic electro-acoustic line-up, keyboardist Carlton Holmes plays percolating Fender Rhodes and tastefully subtle synth alongside stalwart bassist George Mitchell. Tenor saxophonist J.D. Allen delivers soulful phrases with a leisurely cadence and dark timbre, reminiscent of Shorter's esoteric approach. Propelling harmonically sophisticated melodic patterns worthy of Art Blakey and Max Roach with a kinetic momentum equal to Tony Williams' legendary fusillades, Blackman launches an endless salvo of tuneful volleys. Like her forefathers, she keeps rhythm, tempo, dynamics and color in constant flux, never merely playing straight time. The album encapsulates a wide variety of moods, from the dreamily understated "Stars In Eyes" and "Sam Pei" to the simmering boil of the brooding "Black Town." Five assorted variations of "Insight" are scattered across the two discs, serving as recurrent thematic motifs, veering from the brisk, hard-boppish "(From My Father)" to the unassuming, meditative "(From My Mother)." The thunderous "Abracadabra," offers a dynamic, incisive performance, updating a roiling M-Base styled groove with a shadowy Milesian chiaroscuro. "Seven" delves further into metrically intricate rhythms, shifting through fractured tempos with a funky, cubist sensibility. Transcending typical notions of accompaniment, "All I Want", finds Blackman furiously modulating rhythmic combinations on the theme while Holmes unfurls waves of shimmering Fender Rhodes arpeggios over an ominous synth-bass ostinato. The brief, punchy "The Drums and Me" is Blackman's only unaccompanied solo feature; she magnanimously offers the final word to Holmes, who closes the album with a touching solo piano rendition of the hymn "Come To The Garden Alone." A welcome return to her jazz roots, Music For The New Millennium is a powerful and passionate effort from one of the finest drummers on the scene. It's good to have her back. Track Listing: CD1: Abracadabra; Seven; Insight (Past Wisdom); Letter To Theo; Black Town ((For Harlem); Insight (Right Now); For Wayne (Shorter That Is); The Infinite (For My Grandmother); THE ONE (For God). CD2: Sam Pei; The Drums And Me; Stars In Eyes; Insight (From My Father); Theme To Ginger's Rise; All I Want; Insight (From My Mother); Insight (The Future); Come To The Garden Alone. 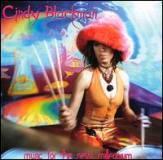 Personnel: Cindy Blackman: drums; J.D. Allen: tenor saxophone; Carlton Holmes: Fender Rhodes, synthesizers; George Mitchell: bass.